RECENTLY, a fellow asked, “why do people trust the opinions of men rather than the wisdom of God?” What surprises me is our surprise when folks do this. As any serious bible student understands, the answer has been revealed to us by God. You see, folks trust the opinions of men because those opinions are first chosen by the seeker and when you go looking to defend sin, you find the opinion that won’t require a change. God’s word requires us to change. It’s called repentance. You see, the UNLEARNED and UNSTABLE do something with the scriptures to defend their sin. They WREST it, in other words, they TWIST them. In the original Greek, the word for WREST is the same word used for TORTURE. What an incredible description of what people are doing to the wonderful word of God to defend their own destruction. 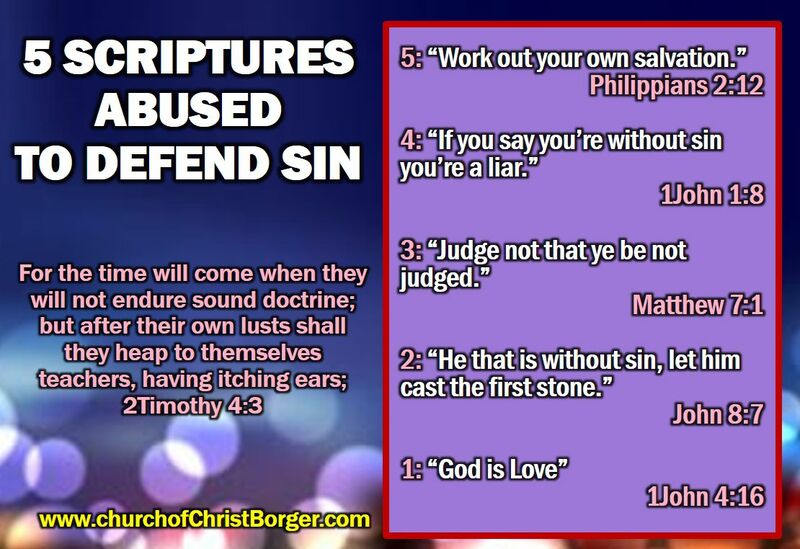 Here are 6 verses used / abused to defend sin. Learn what they really mean so you can defend the truth. ← Why is there division?